Ready, Set, GO! As its hard to believe its once again time to kickoff another formula 1season, which looks like I'll be trying vainly to watch; Err listen to, as we'd purchased tickets to the (March 14th) Two Cellos concert before I discovered when F1 began. Alas, it'll be a semi-tough way to start off the year, since I'm NO longer able to record TV programs; URGH!Which means I'll miss at the very least Qualifying, and most likely Friday's Free Practice sessions too, although Tacoma Bureau Chief Mary Ellen assures me: Do you really think I'm gonna make you miss the first race of the season? Which I'll be aiming to catch the "Peacock-lite" (NBCSN) encore rebroadcast of..
As how times have changed, with '12 being 'DER TERMINATORS (Michael Schumacher) final, final season in F1 - FOREVER! Prior to Seb' Vettel switching to Maranello to try pulling a Michael; Err rabbit outta Fiorano; Hya! While McLaren will surely experience major growing pains this year during its first season with Honda in the vaunted PU (Power Unit) era. As my money; Err Heartstrings are firmly affixed to Team Willy this season, as Valtteri Bottas firmly became my new Numero Uno driver last year, and hopefully will "Break his Duck" this season! Although I still hope eternal for Felipe Massa to once again stand proudly upon the podium's top step, as it'd be most satisfying for Team Willy' to equal Maranello's new boss's expectations of two "W's" *wins) this season! Meanwhile, I'm expecting more good things from the B-I-G' BULLS Daniel 'Ricky Ricciardo, with new 'rooskie team-mate Daniil Kvyat nipping at his heels and being a driver to watch, as Red Bull hopes to challenge the might of Mercedes this year; YAWN! As Chris Horner's in full PR Speak mode as always, but then again I'm still waiting to sell him that bridge I offered last year; Hooah! But don't expect for anyone to knock the "Works" Mercedes Silver Arrows off their perch just yet, as hopefully Nico Rosberg can overhaul Lewis Hamilton this season for the Driver's title, eh? While I think everyone will be hard pressed to wrassle the Constructor's crown away from Mercedes. And who'll be the top rookie from the crop 'O three? As the 'lil Bulls, nee Scuderia toro Rosso have once again tossed out the old bathwater; Uhm, current drivers in hopes of feeling all tingly with Max "Dutch Boy" Verstappen and Carlos Sainz, Jr. 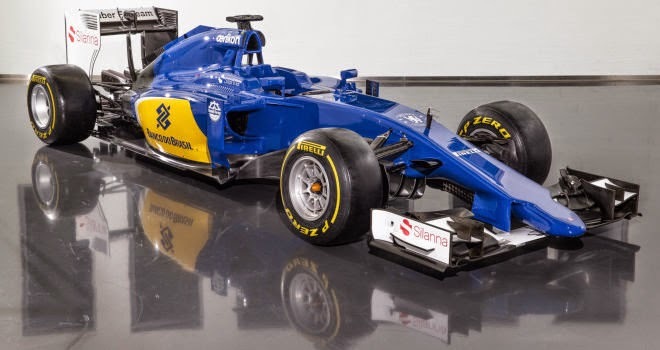 While Felipe Nasr brings his multi 'Kuhzillions Brasilia bank notes to Switzerland alongside Sweden's Marcus Ericsson also ponying up for the opportunity to race for the reconstituted Sauber. While Lotus will hope to emulate Williams transformation from rear of the grid to front-runners via the installation of the almighty Merc' PU attached to its backside! With Force India hoping to remain mid-pack also thanks to its three-pointed star power unit.